You can also follow the direction below. Samuel Cheng received the B.S. degree in Electrical and Electronic Engineering from the University of Hong Kong, and the M.Phil. degree in Physics and the M.S. degree in Electrical Engineering from Hong Kong University of Science and Technology and the University of Hawaii, Honolulu, respectively. He received the Ph.D. degree in Electrical Engineering from Texas A&M University in 2004. He worked in Microsoft Asia, China, and Panasonic Technologies Company, New Jersey, in the areas of texture compression and digital watermarking during the summers of 2000 and 2001. In 2004, he joined Advanced Digital Imaging Research, a research company based near Houston, Texas, as a Research Engineer to perform biomedical imaging research and was promoted to Senior Research Engineer the next year. Since 2006, he joined the School of Electrical and Computer Engineering at the University of Oklahoma and is currently an associate professor and the director of OU-Tulsa Lab of Information and Image Processing. He has been awarded six US patents in miscellaneous areas of signal processing and is the co-recipient of the 2007 IEEE Signal Processing Magazine Best Paper Award. He is a senior member of IEEE and a member of ACM. I was born in Hong Kong. I spent my teenager years in Cheung Chuk Shan College. Then I studied in the Electrical and Electronic Department of the University of Hong Kong. I got a Master degree in Physics under the supervision of Dr. Che-Ting Chan in the Hong Kong University of Science and Technology. I spent one and half year to get my second Master degree in Electrical Engineering at the University of Hawaii. Then, I moved to Texas with my advisor (Dr. Zixiang Xiong) and finished my PhD in Electrical Engineering in Texas A&M University. I spent a summer in Microsoft Research Asia under the Dr. Jin Li's group in 2000 and another summer in Panasonic Lab with Dr. Heather Yu in New Jersey. I joined Advanced Digital Imaging Research after finishing my Ph.D. I worked under Dr. Qiang Wu at that time. Our campus is at the intersection of E 41st and Yale. You can get to our building (Building 4) through any entrance (our campus is not very big). 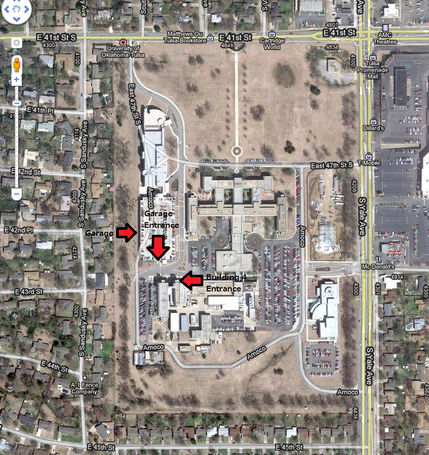 As shown in the map below, our building is right opposite to a parking garage. You can park there and walk across the road. The entrance of the building is shown below. After you get inside the building, get through the right door and you should see an elevator. Please go up to 4th floor. When you exit the elevator, our secretary's office is right next to it. There is a bridge right opposite to the secretary's office. If you walk pass it, you will go to my office. Sometimes the door is locked. You can ask Renee, our secretary, to open the door for you during office hour.